Creative business meeting at modern office in boardroom. 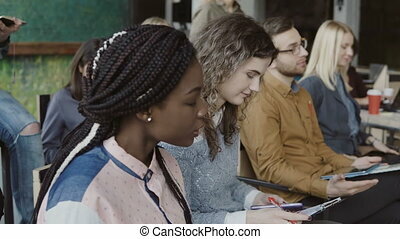 young businessman speaker talking with young mixed race team. 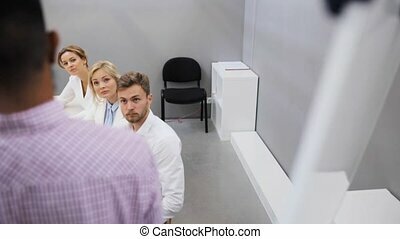 conference for workers. successful male impart experience. 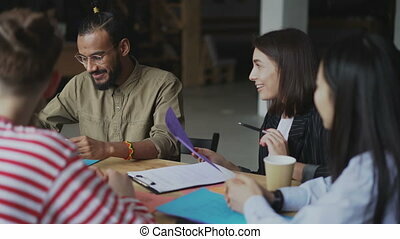 Young male businessmen discussing business at table with laptop in modern office, beginning entrepreneurs working, talking about startup project indoors. 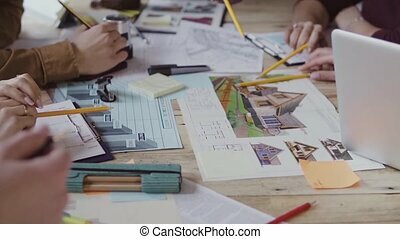 Concept: collaboration, brainstorming, career growth. 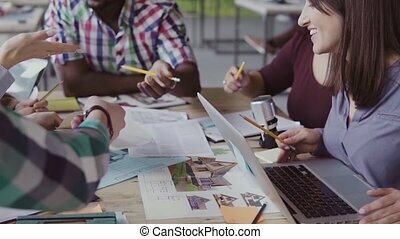 Young employees working with project, writing, sitting at table in modern office, man and woman are taking notes on documents with diagrams, talking in interior near window. Concept: work process, paperwork, workplace. 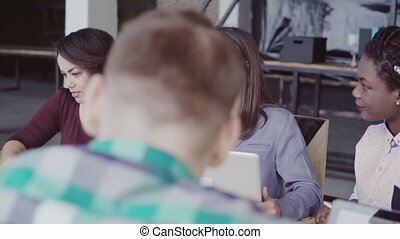 Two young businesspeople collaborating on project at table with laptop in modern office, entrepreneurs talking, sharing ideas, looking at pc screen indoors. Concept: cooperation, working together, staff. 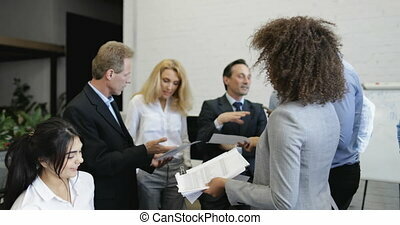 Young businessman talking with mixed race group of people, impart experience. 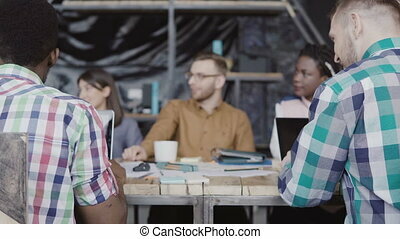 Business creative conference for workers team. Creative meeting at modern office in boardroom. 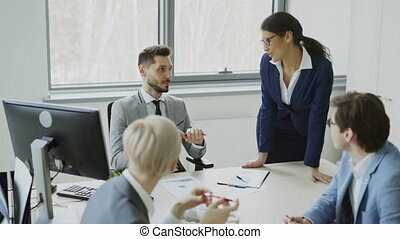 Multiracial team sitting at boardroom at modern office and listening the speaker. 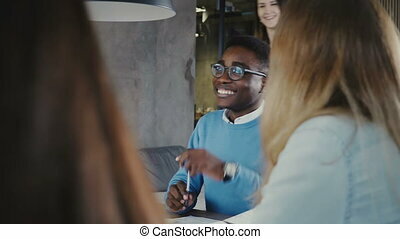 Young businessman talking with mixed race group of people. 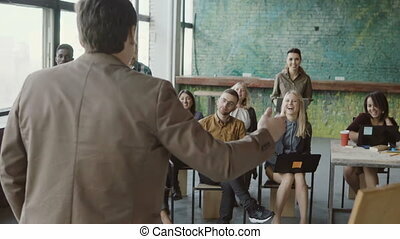 Business conference, seminar. 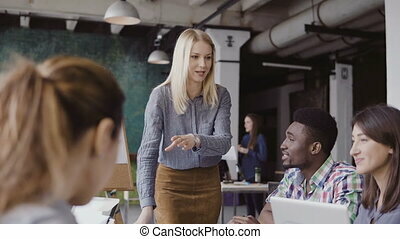 Young blonde woman manager talking with mixed race team. 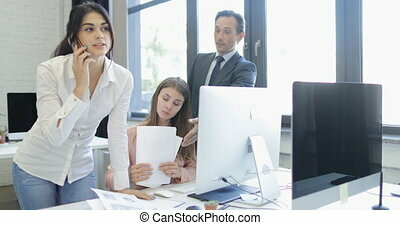 Businesswoman giving direction to colleagues at modern office. Business meeting, brainstorming at loft coworking space. 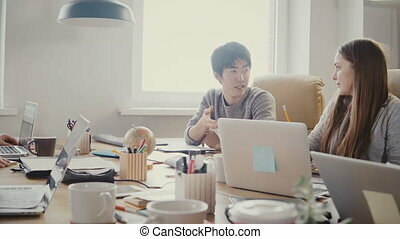 Young creative team working at modern office. 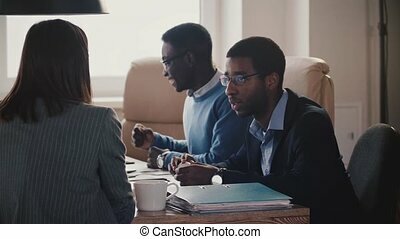 Mixed race business meeting. 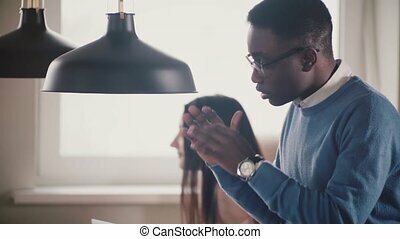 African and caucasian man fist greeting each other. 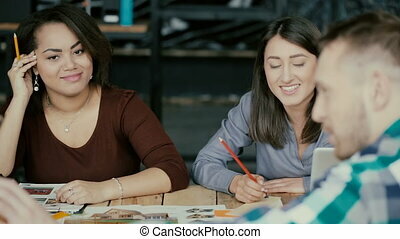 Happy young group of people at coworking space. 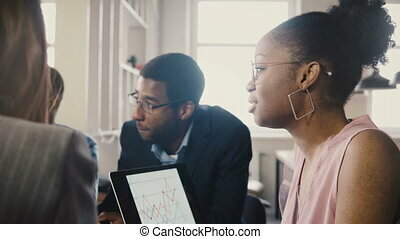 Mixed race team working in modern office. 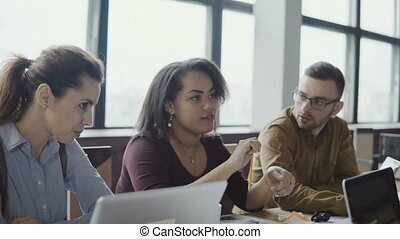 Young creative business team discussing the project. 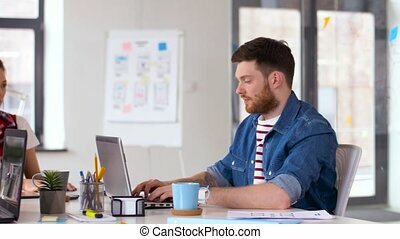 Beautiful female talking, using laptop computer. Small startup company. 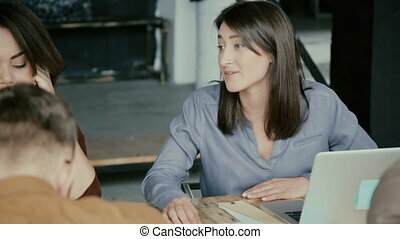 Young African American office worker talking to unrecognizable female business coach at team meeting slow motion. 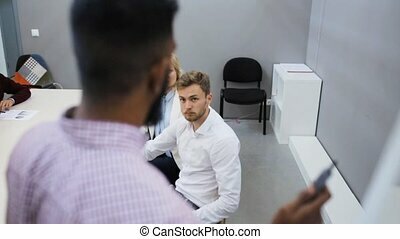 Successful millennial businessman listening to female boss at a job interview. 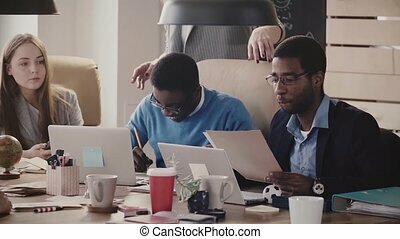 African American businessman at office meeting. 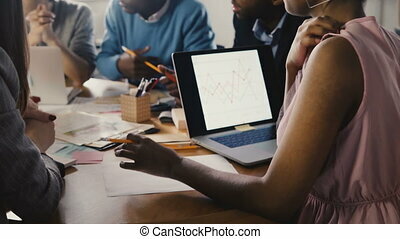 Young multiethnic business people discuss finance diagrams on laptop 4K. 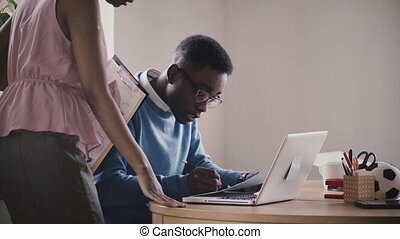 Zoom in on black employee explaining market currency chart on computer screen. 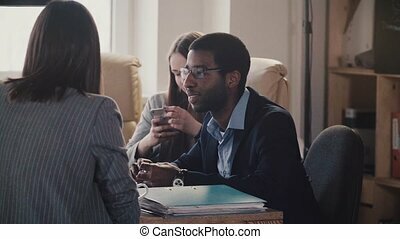 Young African American employee listens to unrecognizable female leader at modern office business meeting slow motion. Confident woman boss leading a job interview by the table in loft coworking. 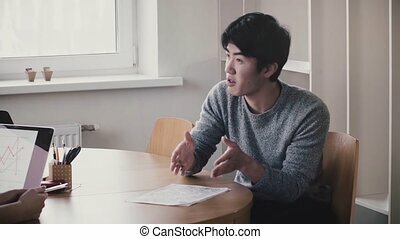 Young handsome happy Japanese man talking by the table, smiling at job interview in modern trendy light office. 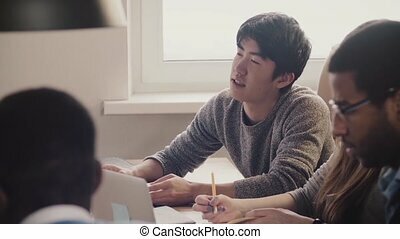 Confident professional Asian millennial employee discussing working process with boss. 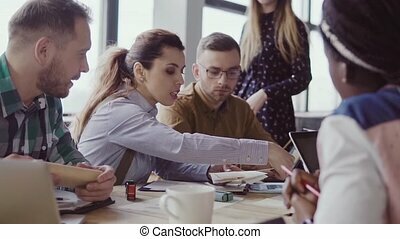 Female employee holds pencil at office meeting. 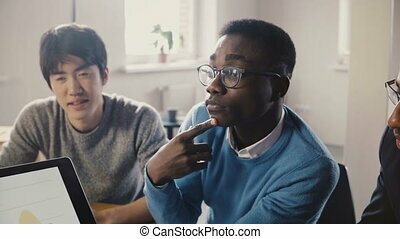 Young multiracial happy millennials work in modern office close-up 4K. 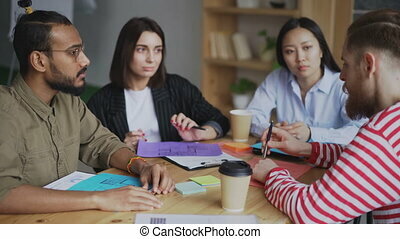 Multiethnic colleagues brainstorming on startup development opportunities. 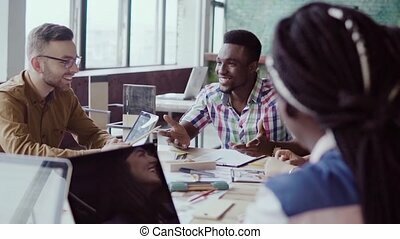 Multiethnic young business people sit by the table and cooperate, work with laptops and talk in modern healthy office, discuss working process, enjoying collaborating in friendly workplace atmosphere. 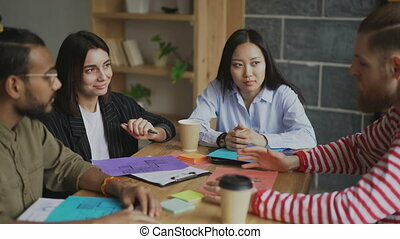 Close-up happy Japanese young employee listening and laughing together with colleagues at multiethnic office meeting. 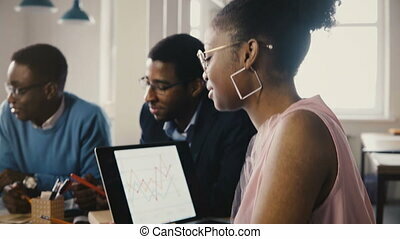 Successful millennial professional worker enjoying working at healthy workplace. 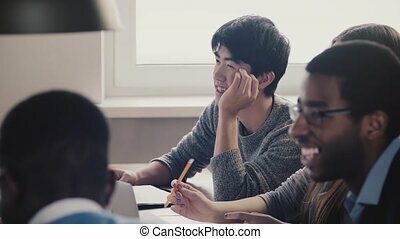 Close-up happy confident Japanese young professional businessman listening and smiling at multiethnic office meeting. 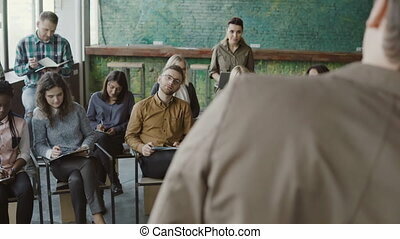 Successful freelance worker focused and attentive at training seminar session.